Delta first began producing cars for the 1-litre F4 championship in the mid 70s, owned by Glenn Hyatt, their first car was based on the 1973 MRE F3 car. Later they produced the IRF4, designed by Ian Reed, it won the 1975 F4 Championship driven by Fergus Tait. Hyatt then took over the Ray Jessop designed Safir RJO3 after Jessop's death in 1976, renamed it the Delta, but lack of finances precluded it being run. The Delta at the 1975 Racing Car Show. 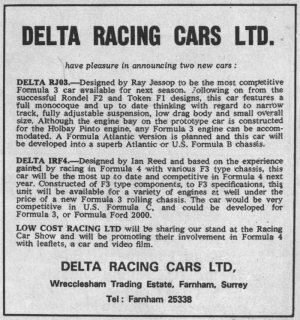 Autosport advert, 2 January 1975. 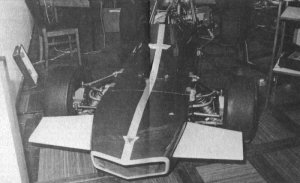 Interestingly a Ray Jessop designed F3 car called the Delta RJ03 that was shown at the 1975 racing Car show. It is very reminiscent of Jessop's Token F1 car of 1974 which was renamed Safir for a couple of British F1 races in 1975. The Safir F3 (q.v.) car also debuted in 1975 so is this an early version of the Safir? Unfortunately the photograph isn't clear enough to answer that but allowing that the Safir also had the RJ03 designation it is likely that the Safir is the developed version (with modified bodywork) of this car. The advert on the left was placed in Autosport and tends to reinforce the above as the Safir was also designed to take the Pinto engine.